This map is based on the Ortelius "Asia Nova Descriptio" , which was the standard map of Asia for more than forty years. 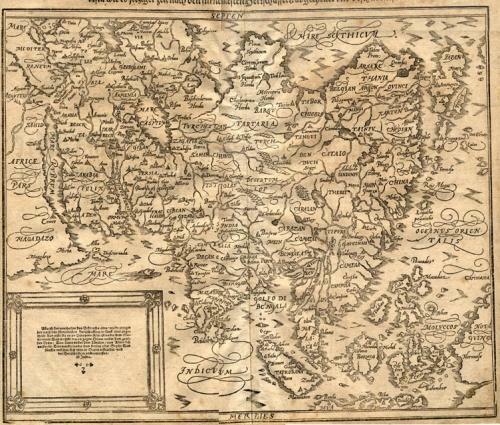 Munster's uncoloured woodcut map of Asia shows Japan, parts of Africa, Europe and New Guinea. The China coastline is truncated and inaccurate, with a mis-shaped and misplaced Japan. There are two small wormholes and the map is trimmed to the upper margin with slight loss to the title.